Add red, green, yellow and blue food coloring separately to each bowl to create 4 different batter colors. Add your butter into your mixer on medium until it's fluffy. Then add your vanilla, milk, and sugar. Separate your frosting into diff bowls and tint the colors you are going for. I used pink, yellow, and blue. 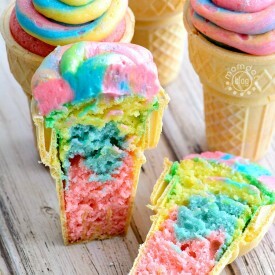 Swirl and Frost cupcakes into your unicorn poop!